The YMCA team is excited to share that the Moving Stronger program is coming to TownLake this spring. Moving Stronger is a 12-week small-group exercise program, designed specifically for people living with MS of all ability levels. It is offered at no cost to participants at the YMCA. 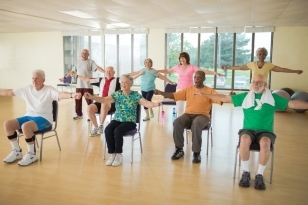 The program offers 2 exercise sessions per week for 12 weeks, led by trained YMCA instructors, including experts in yoga, water exercise, circuit training and functional training. For each exercise modality, modifications are outlined to adapt to each participant’s level of ability, including seated options. The program was launched in Houston in April 2017 and has been very successful in terms of clinical outcomes and community building. We would love to have your help to recruit participants with MS for this program! Please tell your friends and family members with MS. Help us spread the word!